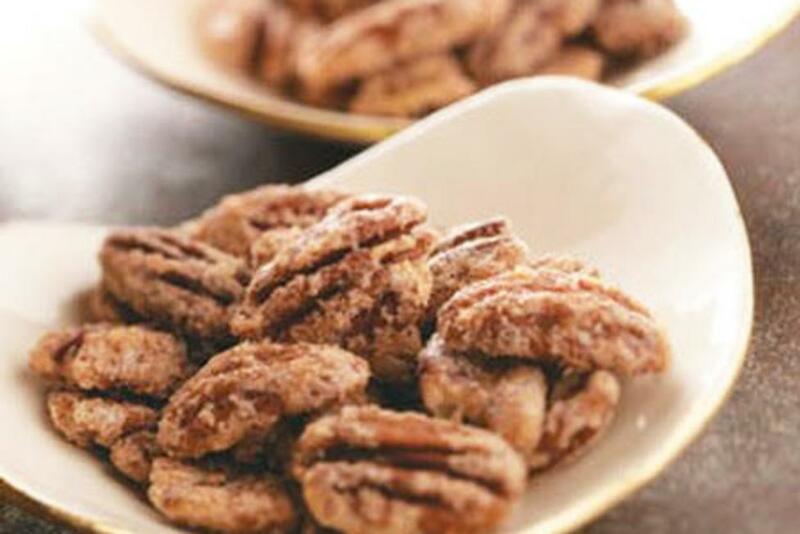 Place pecans in a shallow baking pan in a 250° oven for 10 minutes or until warmed. Grease a 15-in. x 10-in. x 1-in. baking pan with 1 tablespoon butter; set aside. Grease the sides of a large heavy saucepan with remaining butter; add sugar, water, salt and cinnamon. Cook and stir over low heat until sugar is dissolved. Cook and stir over medium heat until mixture comes to a boil. Cover and cook for 2 minutes to dissolve sugar crystals. Cook, without stirring, until a candy thermometer reads 236° (soft-ball stage). Remove from the heat; add vanilla. Stir in warm pecans until evenly coated. Spread onto prepared baking pan. Bake at 250° for 30 minutes, stirring every 10 minutes.